Hi guys–I’ve missed you! I’m back after a few very busy weeks. We’ve moved into a new place (more closet space–whoop!) I replaced my 50mm f1.8 and upgraded to the f1.4! All the craziness of Halloween has finally settled down and now I can fully return to the blogging world. I wanted to come back with some sparkle. 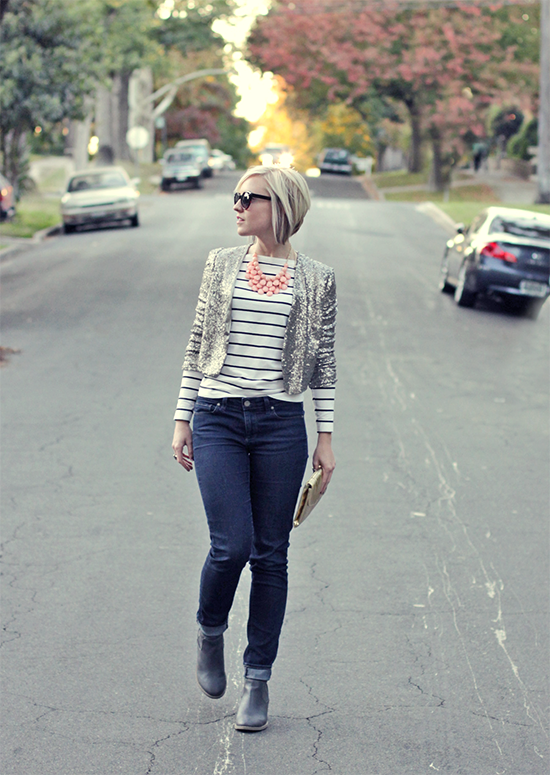 I wanted to show how to dress down a sequin piece. 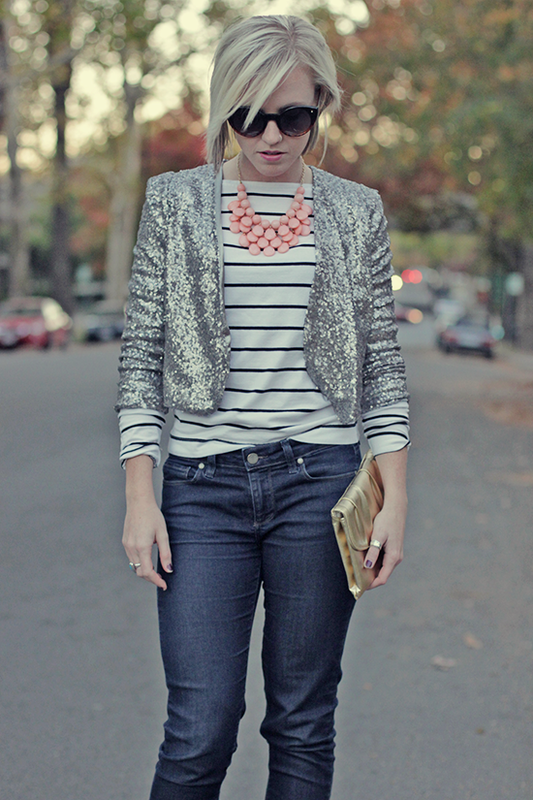 I picked this cropped blazer and blazer it over a long sleeve striped top. For a little extra pizzazz, I added my favorite bauble necklace from Scouted Apparel. I was tempted to add some strappy heels, but to keep consistent with the dress down look I opted for ankle boots. 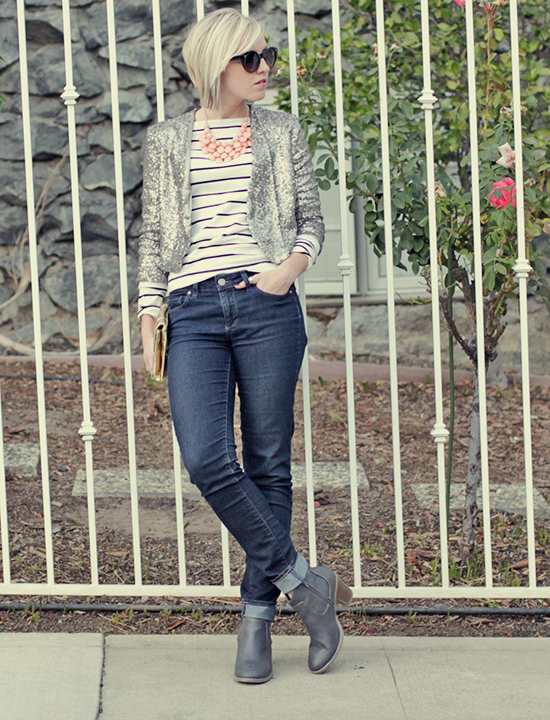 I am SUPER picky about denim. I wear this pair usually 3x week now that it’s a bit cooler. I am an advocate for dropping money on jeans. You will always get your money’s worth out of them. Spend a little extra time finding the right pair for your body and you’ll have not regrets. What’s your favorite brand of denim? Oh, you fancy huh?! Love it and you! What a rad look! 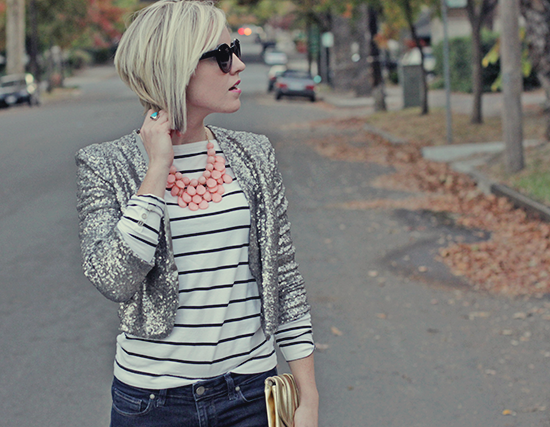 Love the sparkle and necklace.